UMASH was invited to exhibit at the Carver County Dairy Expo on February 19, 2018 in Norwood Young America. This was the 26th year of the Expo and a tradition for dairy farmers, students and agriculture professionals to attend educational sessions browse the trade show and network with peers, industry professionals and educators. 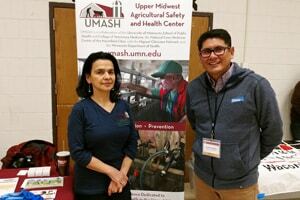 Chela Vazquez and Carol Peterson from UMASH exhibited at the dairy expo and interacted with farmers, workers and other exhibitors. This event targeted the people we want to reach with our animal handling and needlestick prevention resources for both Spanish and English speaking participants. We were also able to connect with farms on our newly funded program – Promoting Worker Health and Safety for Immigrant Dairy Workers. UMASH was happy to be part of the tradition and looks forward to many more opportunities to work with University of Minnesota Extension.